These practical and economical portable lift tables provide a convenient and cost saving solution to numerous material handling situations. The perfect answer for order picking, die handling, assembly operations. 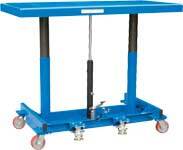 Bishamon MobiLift scissor lift tables are rugged industrial lift tables with push-bars and casters. BX Series lift tables provide improved ergonomics by placing the load at a convenient work height while providing the mobility to locate the lift where it is needed. Southworth Dandy Lifts are essential anywhere that lifting, positioning, assembling, stacking, unstacking, transporting or the need for an adjustable height work surface is part of the job. This light weight highly maneuverable platform lift is ideal for order picking or general material handling. Its quick lift pump with fold up pedal allows quick and easy height adjustment.